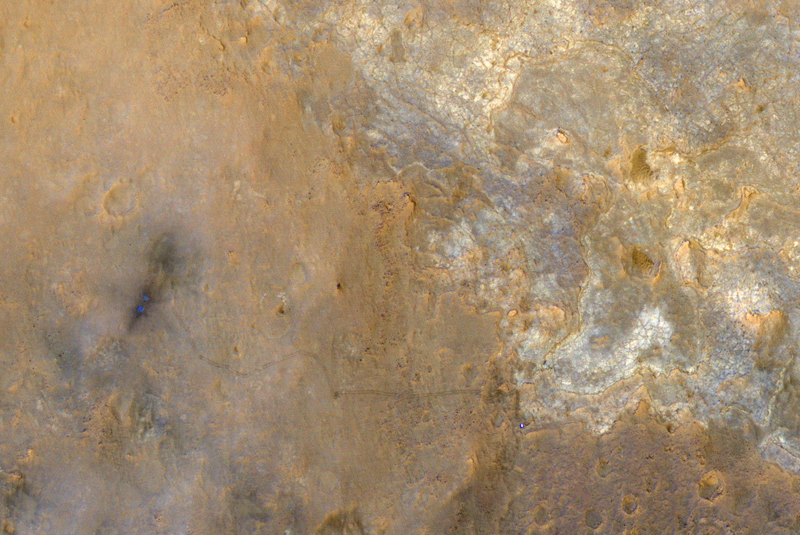 On June 27, the Mars Reconnaissance Orbiter (MRO) in orbit around Mars (duh) took a photo of the Mars Curiosity Rover *on the surface of Mars*! Here’s the link to the NASA photo page where you can download the “full-size” image and zoom in on the details, but you can clearly see the landing site, tracks left by Curiosity as it scooted across the surface of the Red Planet, and an actual reflection off the rover itself! For your convenience, though, I’ve labeled exactly what you’re looking at (first the complete/smaller image and then the cropped section of the full-size image). You can see the scorch marks from the landing jets and two separate track lines (which are about 10 ft apart).